The three-speed selector may seem like a bit of downer if you’re used to a wheel that dials in whatever speed you want on a more traditional palm sander, but this wasn’t an issue with the Makita. We put it through several different projects, from a dresser rebuild to a set of 8′ x 8′ Hungarian shelves like the ones Chuck installed a while back, plus a few others in between. In almost every case, they performed admirably with virtually no difference between a corded unit vs. a cordless. The resulting complaints were very minor — more like niggles than real complaints. The first was the dust bag: it falls off. It doesn’t happen often and normally only when it’s full, but the resulting dust plume when it hits the ground is curse-inspiring. A simple catch or clip of any kind would solve the issue completely. The other issue is one of process, not function. The simple truth is: you will have to change batteries. In our case, under hard load (sanding nine 8′ boards top to bottom for the Hungarian shelves) we needed to change the batteries every 30 minutes or so. The four hours of sanding never left us without a sander as the other battery would indeed last that long. The sander did slow down noticeably before it stopped, which we took as a warning to change up. After a few weeks of operation, that really is the most we could find wrong with the thing. There are many things just flat right with the LXOB01, too: slinging the battery center mass vertically works out great for balance. It takes standard 8-hole, 5-inch hook-and-loop paper discs, and it is nice not to have to bother with a cord. Plus the 18v power pack motor combo delivers enough grunt to get the job done. Does it vibrate? 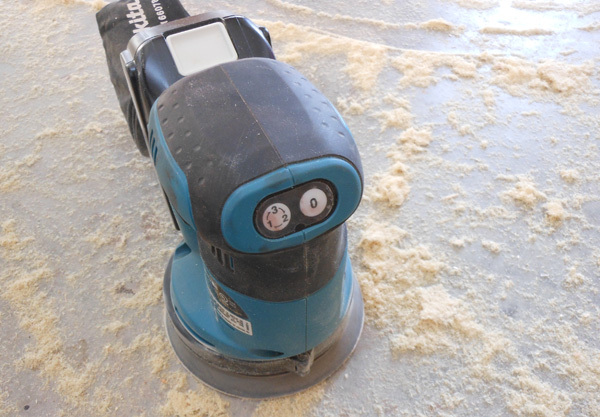 Yes, of course — it’s a random orbit sander; they all do. However, it doesn’t shake you up more than any other machine of its type, and looking for better than that might just be wishful thinking. But is the LXOB01 worth $300? That’s a tough question. If you’re already invested in the Makita 18v Li-Ion line, sure. It’s a no-brainer as the tool itself is only $105 without the pack, bag and charger. If you’re looking for an entry into the system it might be a little steep but no one thinks twice about shelling out extra cash for a Li-Ion cordless drill over a corded one, either. Regardless of my personal viewpoints at the outset, the LXOB01 does work as advertised for run time, function, and durability. It’s a solid tool currently ahead of its time compared to the rest of the market. I find this an interesting tool. However, I will pass for the simple fact that any time I do sanding, I hook my vacuum up. If I already have the hose, then I might as well run the power cord along it. I can see situations where being cordless would be beneficial, but I cannot justify the cost for those limited instances. Cordless anything definitely has it’s uses, where it would be impractical to run hundreds of feet of cord out to whatever needs drilling, cutting, or sanding. The $100 price and limited battery life, which requires the investment of several batteries if you plan to do sanding for more than a few minutes without a second battery and/or a charger around, will probably keep this in the realm of the Makita fanboys or those who will be getting their drill and other tools. Otherwise, you can get a good corded palm sander for $20-50 all day long. Still, I’d rather the good brands offer this stuff than not make it at all. 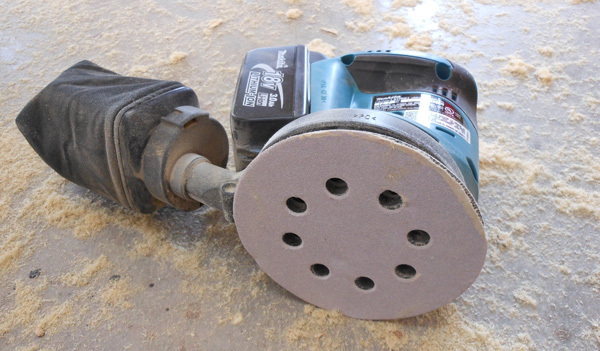 I’m not invested in the Makita 18V line, so I think my $100 would be better spent on one sweet corded sander. I replace drills often enough to warrant latest generation battery technology. Not so with sanding, cutting and grinding equipment. I find that corded tools for those jobs are a better investment. But sweet palm sander. Can’t wait to see how these get improved upon. This is an good tool, but there are better on the market. While no cordless tool would be up to production sanding – few corded tools fit the bill either. In our cabinet shop – air sanders are the rule – but these are impractical for the jobsite – where corded ROS and hand sanding blocks (for easing a small edge) seem to fit most finish sanding needs. 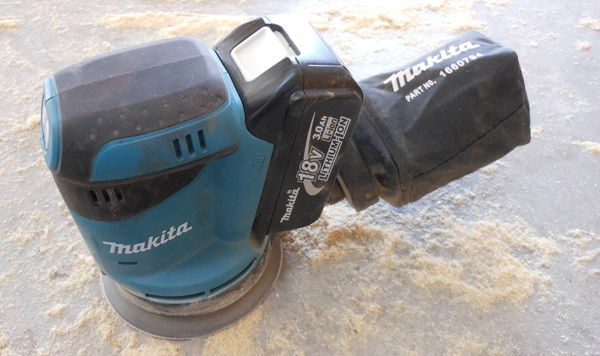 As others have said, I’m not sure where a cordelss sander fits in – and even though we are heavilly invested in the Makita 18V lineup – I don’t see adding this tool. Truthfully, having to wait 30 minute to sand would not only slow down my projects, but drive me crazy in the process. Several years ago, I actually bought myself a Dewalt D26453 and this tool is corded and whilst did need servicing before the warranty lapsed, this makes sanding and polishing much easier and quicker. There’s 2 batteries. You’re using the one while the other is charging. No downtime. Makita has the best charge time at 30 minutes. DeWalt is about an hour in perfect room temp conditions. If you want cordless this is a grea tool, if not stick to your corded “fill in brand of choice here”. I am already invested in the Makita 18v tools and I was so happy to add this sander to the arsenal. I bought it to help smooth the edges on the trim throughout my girlfriend’s house before we painted and it preformed like a champ. It worked for 5 hours straight using only two batteries. The charge seemed to last just long enough for a recharge on a spent battery. I have one and love it for repair work. It’s great for repairs like sticky doors and smoothing edges after cutting holes for duct work and microwave hood installs. I like it for corral and building repairs as well (need to have clean splinter free surfaces for livestock. I’ve tried the makita before and it does vibrate considerably less than other sanders i’ve tried. Perfect for someone like me whose got arthritis in the hands!